Kamakahonu Royal Center at Kailua Bay was the residential compound of Kamehameha I from 1813 until his death in 1819. It had previously been the residence of a high chief, and it was undoubtedly a residential area back into the centuries prior to European contact. Kamakahonu (which literally means eyes of the turtle) was the location of multiple heiau known collectively as Ahu‘ena, originally said to have been built by either Liloa or his son Umi-a-Liloa during the sixteenth century, was reconstructed and rededicated by Kamehameha I in the early nineteenth century. Kamehameha first moved into the former residence of Keawe a Mahi. He then built another house high on stones on the seaward side of that residence, facing directly upland toward the planting fields of Kuahewa. Like an observation post, this house afforded a view of the farm lands and was also a good vantage from which to see canoes coming from the south. The royal residence at Kamakahonu was served by a series of anchialine pools, upwellings of fresh and salt water found on young lava fields. These anchialine pools were used to raise bait fish and shrimp for larger catches. During Kamehameha’s use of this compound, reportedly 11 house structures were present. These included his sleeping house, houses for his wives, a large men’s house, storehouses and Ahuʻena heiau. Kamehameha also included a battery of cannon and large stone walls to protect the fortress-like enclosure. Upon Kamehameha’s death, a mortuary house was built, which held his remains until they were taken and hidden away. After Liholiho’s departure from Hawaiʻi Island in 1820, the high chief Kuakini, who served as Governor of Hawai’i for many years, resided here until 1837, when he had Huliheʻe built and moved there. By the late-1800s, Kamakahonu was abandoned and in the early-1900s H. Hackfield & Co. purchased the land, and its successor American Factors used the site as a lumberyard and later for the King Kamehameha Hotel. Today, three remnant structures are present on the seaward beach of the property (all recreated in the 1970s and recently refurbished) – ‘Ahu’ena heiau, the mortuary house’s platform and an additional structural platform. These structures are set aside in a covenant agreement between the State’s Historic Preservation Division and the current hotel owners. Kamakahonu became the backdrop for some of the most significant events in the early nineteenth-century history of the Hawaiian Kingdom. In the early morning hours of May 8, 1819 King Kamehameha I died here. The first Christian missionaries from New England were granted permission to come ashore here on April 4, 1820. The property is now part of King Kamehameha’s Kona Beach Hotel; none of the original houses or walls remain. Ahuʻena heiau was reconstructed in the 1970s at 2/3-scale and can be viewed, but not entered. The small sandy beach provides a protected beach for launching canoes and children swimming. The first Hotel was built here in 1950; it was imploded (boy, that was an exciting day in Kona) and the current one constructed in 1975. Kamakahonu is one of the featured Points of Interest in the Royal Footsteps Along The Kona Coast Scenic Byway. We prepared the Corridor Management Plan for the Scenic Byway. 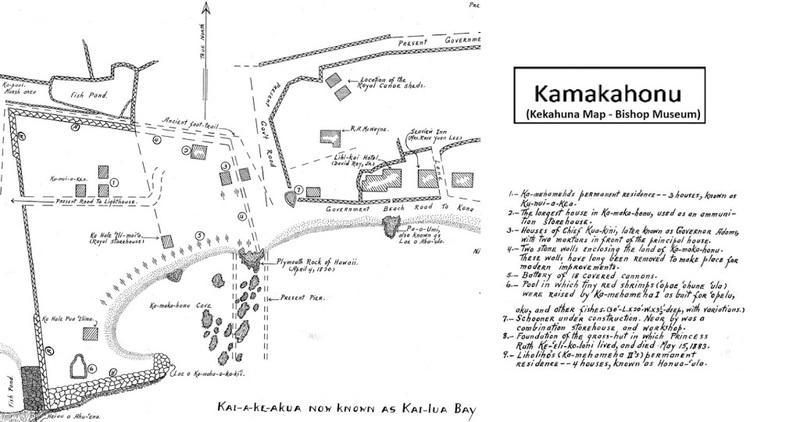 The image is a portion of a Kekahuna map (Bishop Museum) noting the Kamakahonu Royal Center. In addition, I have placed other images and maps of Kamakahonu in a folder of like name in the Photos section on my Facebook page. Each followed protocols, traditions and kapu. Even though kapu and traditions guided people on how to behave, sometimes innocent people got caught in the middle of feuding chiefs. A story suggests that on one occasion, Kamehameha I was fighting in Puna. While chasing two fishermen (presumably with the intention to kill them), his leg was caught in the reef and, in defense, one of the fisherman hit him on the head with a paddle, which broke into pieces. The story continues that Kamehameha learned from this experience and saw that it was wrong to misuse power by attacking innocent people. Years later, Kamehameha summoned the two fishermen. 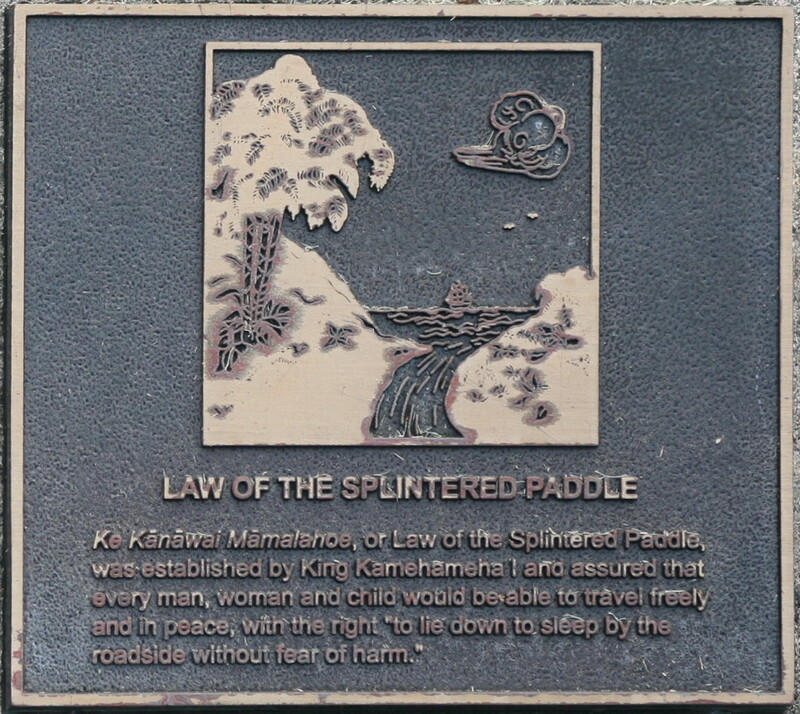 When they came, he pardoned them and admitted his mistake by proclaiming a new law, Kānāwai Māmalahoe – Law of the Splintered Paddle. ‘A‘ohe mea nāna e ho‘opilikia. “Let every elderly person, woman and child lie by the roadside in safety”. It has become a model for modern human rights law regarding the treatment of civilians and other non-combatants. Kānāwai Māmalahoe appears as a symbol of crossed paddles in the center of the badge of the Honolulu Police Department. Hawaiians had many forms of worship and places where they practiced; invoking peace, war, health or successful fishing and farming, etc. Families and individuals conducted daily worship services at home, typically at small family improvised altars or shrines. Small, common places of worship were the ko‘a (fishing,) ‘aumakua (family god) and other shrines. There are many types and forms of heiau, which served as temples and ceremonial sites. Some were used for state worship -where only the paramount ruler of the island and priests were allowed to enter. Other heiau were used by lower chiefs and priests who controlled smaller political land divisions, and still others were used by individual families who resided in a given area. Whatever the purpose, heiau are considered sacred and are places where material offerings and prayers in the form of formal supplications were tendered to the gods. These structures were typically stone-walled enclosures containing several structures and open-air terraces, stone platforms and carved idols in which chiefs paid homage to the major Hawaiian gods. The agricultural or economy-related heiau were dedicated to Lono, where it was believed that offerings would guarantee rain and agricultural fertility and plenty. The ho‘oulu ‘ai heiau were devoted for a successful season for growing crops to increase the general food supply. The lapa‘au heiau dealt with healing. Herbal remedies and spiritual healing treated illnesses by trained healers. The surroundings served as the natural pharmacy for plant remedies of all kinds. The large sacrificial government war temples, luakini heiau, contained altars where human lives were taken when assurance of success in combat was requested or when there was a very grave state emergency, such as pestilence or famine. Reportedly, oral traditions trace the origin of Hawaiian luakini temple construction to the high priest Pāʻao, who arrived in the islands in the late-thirteenth century. He introduced several changes to Hawaiian religious practices and social structure that affected temple construction, priestly ritual and worship practices. Prior to the Pā‘ao’s arrival, the Hawaiians worshipped unseen deities. Reportedly, Pāʻao provided the people with something tangible to worship, through the introduction of wooden temple images as representations of the gods. These images were not worshipped as gods themselves, but it was thought that the mana or spirit of a god would occupy the carved statue and could be consulted in times of need. Heiau were constructed under the direction of the ali‘i nui (high chiefs) and kahuna (priests) and were dedicated to different gods for various purposes. Heiau could change over time with a new ali‘i. It was not unusual for a heiau to be expanded and modified by a new ruling chief. Though temple worship was primarily an activity of the royalty, the general population depended upon the effectiveness of these rituals. Hawaiians looked to the heiau and their kahuna for order, spiritual help, understanding and guidance. This was for practical matters, such as, when to plant and harvest, fishing and fishing kapu, healing, giving thanks and going to war. I touched on this before, but some waaay cool stuff has been going on at Keauhou, on the Big Island, so I wanted to give a little more detail on it. Over the past several years, Kamehameha Investment (a for-profit arm of Kamehameha Schools) has been restoring heiau on its Keauhou Resort properties. As background, formalized worship, offerings and/or sacrifice by chiefs took place in temples, or heiau. These structures were typically stone-walled enclosures containing several houses and open-air temples with terraces, extensive stone platforms, and numerous carved idols in which ruling chiefs paid homage to the major Hawaiian gods. There were several types of heiau: including agricultural, economy-related, healing or the large sacrificial war temples. Erecting heiau was the prerogative and responsibility of the Ali‘i, for only they could command the necessary resources to build them, to maintain the priests and to secure the sacrifices that were required for the rituals. Though temple worship was primarily an affair of the royalty, the whole land depended upon the effectiveness of these rituals. Three significant heiau have been restored at Keauhou: Hāpaiali‘i Heiau, Ke‘ekū Heiau and Mākole‘ā Heiau. Using modern-day technology coupled with ancient techniques, restoration of the heiau using the Hawaiian art of uhau humu pōhaku (dry stack masonry) have rebuilt the massive stone platforms. Information suggests that Hāpaiali‘i Heiau was built by Ma‘a, a kahuna of Maui, who later left for Kaua‘i. The period of Ma‘a was said to be later than that of Pa‘ao. Carbon dating indicates the heiau was built on a smooth Pāhoehoe lava flow sometime between 1411 and 1465. The heiau was for prayers only. Ke‘ekū Heiau is an imposing, heavy-walled enclosure surrounded on the west, north, and east by the ocean at high tide. Tradition indicates that, after building it, Lonoikamakahiki attacked Kamalalawalu, king of Maui, who had invaded Hawai‘i, and that after defeating Kamalalawalu, Lonoikamakahiki offered him as a sacrifice at Ke‘ekū. The spirits of his grieving dogs, Kauakahi‘oka‘oka and Kapapako, are said to continue to guard this site. Outside the entrance to the heiau and towards the southwest are a number of petroglyphs on the pāhoehoe. One of them is said to represent Kamalalawalu. During restoration, it was discovered that the heiau also served as a solar calendar. On the winter solstice, from a spot directly behind the temple’s center stone, the sun sets directly off the southwest corner of the heiau; at the vernal equinox, the sun sets directly along the centerline of the temple and at summer solstice, it sets off the northwest corner. Mākole‘ā Heiau (also known as Ke‘ekūpua‘a,) is located 600 feet from the ocean, on the same tidal flat as Hāpaiali‘i Heiau and Ke‘ekū Heiau. The backwater nearly encircles Ke‘ekū Heiau at high tide does not quite reach Mākole‘ā. Tradition indicates that the heiau had been built (or consecrated) by Lonoikamakahiki and that it was used for prayers in general. Historic Hawai‘i Foundation awarded Preservation Honor Awards for these efforts. I applaud Kamehameha Investment for these restorations. While ruins of a heiau are impressive, I really think people today can get a far better appreciation of what heiau are, after they have been restored. The photo notes the before and after of the restoration of Hāpaiali‘i Heiau (photos primarily from Keauhou Resort.) In addition, I have added other images of the Keauhou heiau restoration in a folder of like name in the Photos section of my Facebook page.